Facebook has long used a sophisticated algorithm to determine the reach of posts in its main feed. Delivering the right content to the right people at the right time is crucial. With content from friends, Pages, and advertisers flooding News Feeds, the social network relies on what it calls “relevance” as one of many factors to determine not only what posts members engage with but also what ads they see. 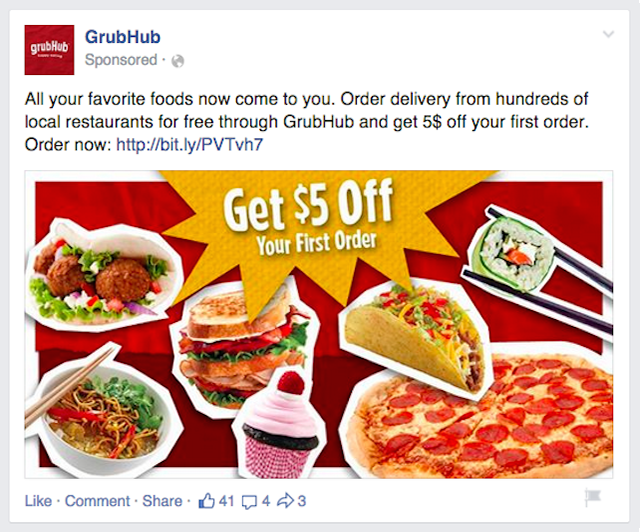 Now, Facebook is specifically honing in on the efficacy of News Feed ads for businesses. With Facebook relevance score, advertisers get a more transparent view on the back end of how their ads are performing, allowing them to make tweaks to campaigns and extend their company’s ROI. It’s a win for everyone: the more relevant the ad, the higher the engagement. “Taking relevance into account helps ensure that people see ads that matter to them, leading to a better experience for people and businesses alike,” Facebook wrote on its blog. To that end, here’s everything you need to know about Facebook’s advertising relevance score — and how to leverage it across your broader marketing strategy. The Facebook relevance score for ads is available globally and can be viewed in any of the social network’s ads reporting tools or through its ads API. 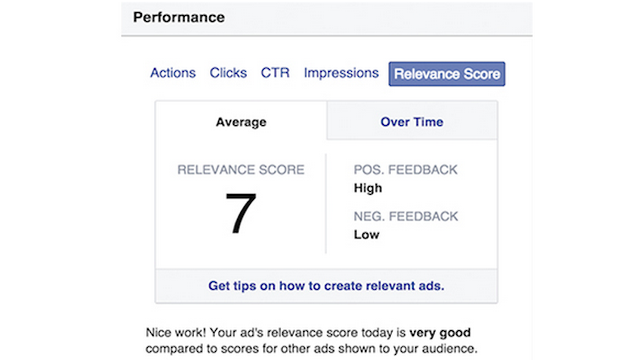 Of course, to see the relevance score of your ads, you must already be a Facebook advertiser. If you need help getting started with Facebook advertising, check out this guide. With your ads up and running, you can begin tracking your relevance score — a particularly good data point to be aware of. Why? Because shifts in your score will help you identify trends and think more strategically. It may even save you money. Click Reports on the left menu. Check Relevance Score. For more information, check Positive Feedback and Negative Feedback. On your Reports page, click Level and select Ad. The relevance score column will display a number between 1 and 10, while positive and negative feedback will be shown as a rating of low, medium, or high. Don’t see a relevance score? That’s because your ad needs at least 500 impressions before the data will appear. Your relevance score is a metric in ads reporting that provides an estimate of how relevant an ad is to its target audience. A score of 10 is considered the most relevant; a score of 1 is the least. When your ad’s score is high, it’s more likely to be shown to your audience. Facebook calculates this score based on the positive and negative feedback it expects your ad to receive from its intended audience. The more positive interactions expected, the higher your ad’s relevance score will be. If Facebook expects more people to hide or report your ad, your relevance score will be lower. A low initial score doesn’t mean you’re locked in forever; the score will update as people interact with and provide feedback on the ad. Keep in mind that ads with guaranteed delivery, such as those bought through reach and frequency, aren’t impacted by relevance score. According to Facebook, the score has a smaller impact on cost and delivery in brand awareness campaigns since those ads are optimized for reaching people rather than driving a specific action. Used strategically, your relevance score can help you in a few key ways: it lowers the cost to reach an audience; it allows you to test ad creative options before running a full campaign; and it provides insights to optimize campaigns already in progress. Here’s what all of that means. Simply put, the higher a Facebook ad’s relevance score, the less it will cost to be delivered. This is because Facebook’s ad delivery system is designed to show the right content to the right people, and a high relevancy score is viewed as a positive signal. Relevance, however, isn’t the only factor considered by the delivery system. Bid also plays a role. For example, if two ads are aimed at the same audience, there’s no guarantee that the ad with an excellent relevance score and low bid will beat the ad with a good relevance score and high bid. The key takeaway here is that, overall, having a strong relevance score will help you see more efficient delivery through Facebook’s system. This is something we always recommend doing to optimize your ads, and relevance scores add another layer of success measurement. You can test different combinations of images and copy with different audiences, and learn which combinations offer the highest relevance scores. Monitor your ads’ relevance scores while campaigns are running to identify fluctuations. Watch for patterns in your existing ads that might lend insights into what works: which of your ads have the highest score and what do they have in common? If a score starts to dip, you may need to refine the creative or targeting. 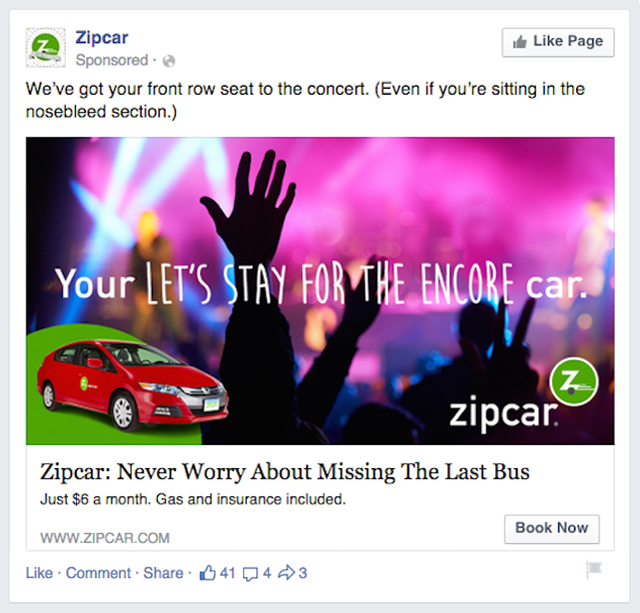 Facebook warns that relevance score shouldn’t be the primary indicator of an ad’s performance. The most important factor for success on Facebook is bidding based on the business goal you hope to meet with an ad. Let’s say that you want to run a campaign that drives online sales. The desired outcome is more important than your relevance score. If you have an average score but a solid bid, and your ad is meeting your goals, you probably don’t need to change anything. Simply put, having a good relevance score isn’t the be-all and end-all of your performance. If anything, consider tweaking the ad to see how you can get lower cost of delivery by improving the score, or monitor your score, along with the sales you’re driving, to learn when it’s time to update your campaign. Want to maximize your impact? Here’s what to do to get that score up. Behold: targeting done well. It’s clear that Zipcar is speaking to a younger audience that enjoys the perks of city living (though that often comes at the expense of owning a car). Think about how your ad’s message and execution will resonate with your audience. Images and multimedia are more noticeable than text, so focus on improving that first. Also, show the benefit of your product, not just the product itself. For example, instead of using a screenshot of your food delivery app, show off the meals that customers can order using it. Your message should match the audience you’re targeting. Need to reach two different groups? Don’t cram that all into one space. Create two separate ads with customized messaging that gets right to the point. Facebook’s relevance score may have cross-channel implications. It’s up to you to determine, but if you’re advertising on other social networks (or even offline) and you’re trying to reach the same target group, take insights gleamed from your tests and consider applying them to those campaigns. The Facebook relevance score may give you insights, for instance, into messaging that is twice as relevant to a specific audience. Use that number to inform your broader segmentation strategy across all of your advertising channels. Your team’s decisions moving forward will be more data-driven rather than opinion-based, and your brand will be more relevant than ever.